Models are an important part of your photos and videos. By adding your models to the system, they can be automatically tagged in all the files, allowing you to measure which models perform well in different contexts. Tap Add Photo and pick a photo from the iPad’s photo library. Enter a Display name and Tag name. The display name is what you see on the iPad and will not affect your files. The tag name is the phrase that will be added to your files’ metadata. Tap on a model to open the model details panel. Video Presets are where you define the types of videos you'd like to end up with after your session. Use them to preconfigure the name, aspect ratio, video template and more up front, and pick which ones to use when creating a new outfit. The display name is a straightforward description that makes it easy for yourself and others to recognize the preset while working with StyleShoots. It will not influence the folder naming or your exported files. The exact name of the folder your files will be saved into. Create a name that fits your file management standards. Video templates provide a starting point for your video, including transitions, pace, camera movement and framings. 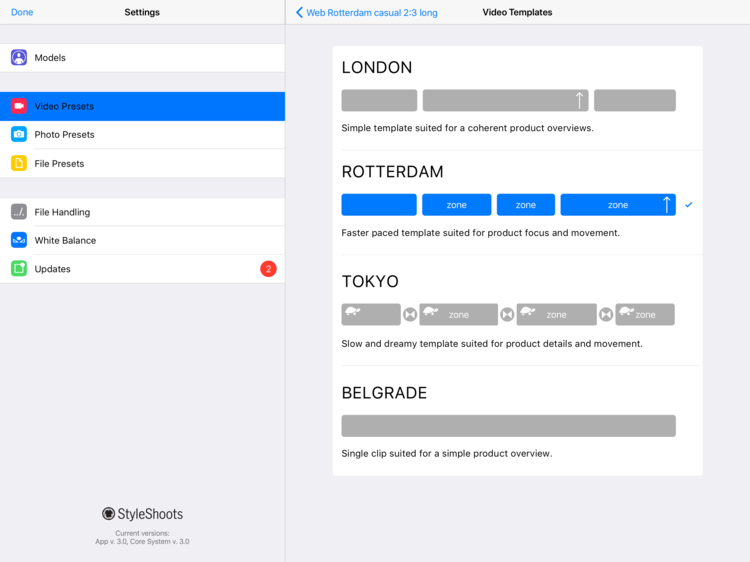 Tap Video Template to pick among a selection of templates for your video. Watch the example videos to get a sense of the framings, cut and pacing of the template. TIP: The final look of your videos depends fully on you model, clothing, lighting and set design, including which background color and accessories you use. See the video template like a base structure to which you add you own creativity. Choose between Shorter, Medium or Longer to alter the video length. The final length will depend on the video template. 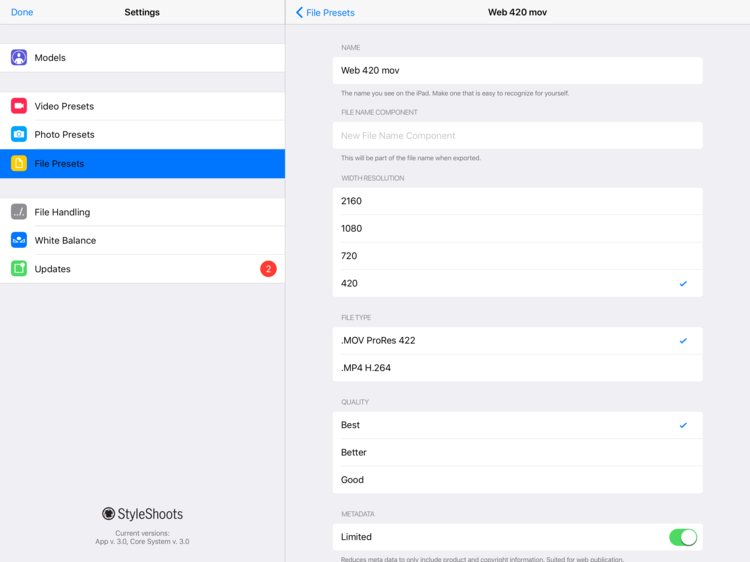 Choose between a list of possible aspect ratios (width vs height) for your videos. The ideal ratio depends on where you are planning to use your video. 4:5 works well on websites and apps like Instagram. 2:3 works well for most websites. 9:16 works well for digital signage and full screen apps like Snapchat. Photo Presets are where you define the types of photos you'd like to end up with after your session. Use them to preconfigure the name, aspect ratio, framings and more up front, and pick which ones to use when creating a new outfit. The name is a straightforward description that makes it easy for yourself and others to recognize the preset. It will not influence the folder naming or your exported files. Choose between a list of possible aspect ratios (width vs height) for your photos. The ideal ratio depends on where you are planning to use your photos. Framings are predefined fully customizable camera positions that can be accessed from Live View during a session to save time and ensure consistency. Select the newly added framing icon. The camera position details are shown in the Live View. Enter a name for your new framing. The name is added to the file names during export, making it easy to find your files. Tap Edit in the upper right corner to enter edit mode. Drag the framing up or down using the three horizontal lines icon. Tap the delete icon and tap Delete to confirm. File presets let you define file format, dimensions and compression quality. During the process of exporting, you can choose which file presets you want generated. The name you see on the iPad. Make one that is easy to recognize for yourself. Choose a resolution based on where you plan to use your video. Tip: Many social apps and online video players accept high resolutions and automatically downscale videos to best fit the receiving device. So often you can choose a single high resolution format and simply reuse the same file across all platforms. This simplifies file management and saves time during export. Set the file format and quality to your preferences. MP4 - encoded in H.264. MOV - encoded in ProRes 422. Tip: StyleShoots Live automatically adds a range of meta data tags to all photos and videos exported from the system. See full details and list of tags under File Handling. You can limit the amount of metadata information embed by turning on the setting 'Limited'. This reduces metadata to only include product and copyright information, suited for web publication. Choose a resolution based on where you plan to use your photos. The height is automatically calculated based on the selected aspect ratio (see above). Tap the text in the Width Resolution field to bring up the keyboard. Enter a value between 200 and 3648 px. Tip: Many social apps and online video players accept high resolutions and automatically downscale photos to best fit the receiving device. So often you can choose a single high resolution format and simply reuse the same file across all platforms. This simplifies file management and saves time during export. Set the file format, quality and metadata extensiveness to your preferences. File Handling lets you configure the folder path and separator character used by the system. Workfolder is the folder you pick or create on the iPad when starting a new export. Product is the name of the product that appears in the given photo or video. Preset is the name of the Video Preset or Photo Preset used to create the file. You can customize this name inside the Presets you create. For examples of file names and folder structures, visit File Handling. You can set the global white balance of the system with just one tap. NB: Be sure that you want to change the system's white balance. Changes will affect all videos and photos, including those not yet exported. It is not possible to revert to a previous white balance. Tap the lock icon to unlock the Live View. The camera moves into position. Tap the gray target to set the white balance. The changes will be reflected instantly in Live View. If you are not happy with the result, tap again. In the Updates section you can view and install new software versions, and see a list of previous releases and what they each contained.